Most of the bikes that grace these pages that have had some welding done on them, somewhere. If you’re building your own custom bike—or even if you just like fiddling in your garage—welding is an invaluable skill to have. It’s also a slightly intimidating prospect for the initiated, so this is a two-part guide. This week, we’ll dig into the theory, explain the different types of welding, and help you figure out which machine to get. What is welding? In a nutshell, welding can be defined as the fusion of two pieces of material. I say ‘material’ because we can weld plastic as well as metal (for this article, we’ll focus on metal). 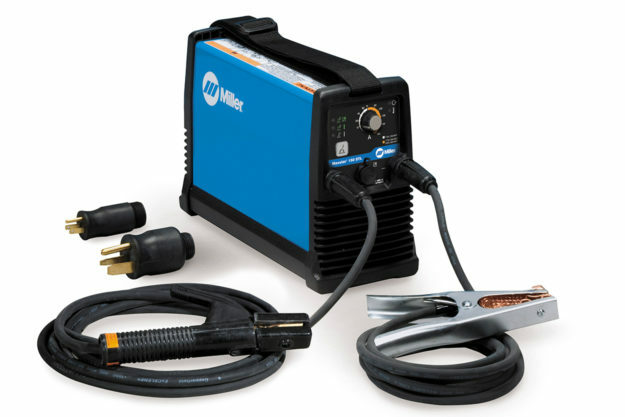 Welding technology has progressed to the point where high quality welding machines are now affordable for small shops, farmers, artists and hobbyists. Creating items from a pile of metal with the aid of welding is surprisingly satisfying. But don’t expect to pick up a welding torch and lay down a perfect bead first time—like any new skill, it takes practice to create joints as strong and attractive as you’d find on a factory frame. Benefits of welding Welding is obviously a permanent process, compared to bolting parts together. If two parts are made of the same material, they can be welded. 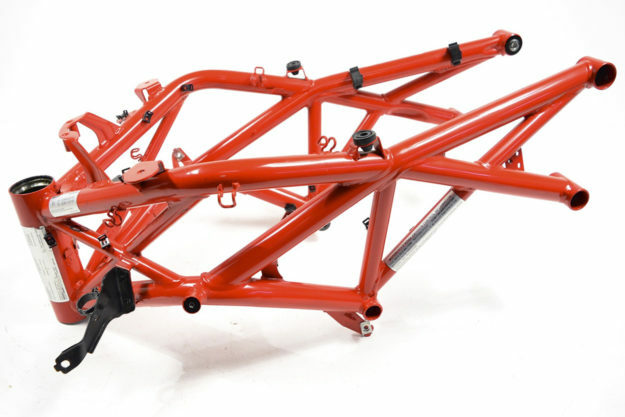 It allows you to make a complex shape, like a motorcycle frame—a whole bunch of tubes and plates, assembled into a strong and durable structure. We can split welding into two categories: Fusion welding is common on our motorcycles, and requires the melting of the metals being joined; Non-fusion welding also requires heat to work, but we need to add a filler material that melts at a lower temperature than the parent material (such as soldering). Manual Metal Arc Welding One of the earliest welding processes developed, arc-welding uses an electric arc to generate the heat required to melt the metals involved. The welding machine generates voltage at the end of a consumable electrode, and an arc is struck on the work piece, which is connected back to the welding machine via a grounding cable. The electric arc melts both the work piece and the end of the electrode, and carries molten metal from the end of the electrode to the work piece. This ‘filler’ metal builds up the size of the weld. The electrode is covered with a ‘flux,’ which melts and forms a protective gas shield around the weld, preventing contamination. This then solidifies on the weld deposit to form a protective ‘slag,’ which has to be chipped off to reveal the weld beneath. The welding machine will have controls to adjust how much current flows through the circuit, and different electrodes are available to suit different metal types and thicknesses. As metal is deposited from the electrode onto the work piece, the electrode gets shorter, and must eventually be replaced. The cheapest hobby welding machines you will find at your hardware store will probably use this process. I wouldn’t consider it a contender for your motorcycle project, as other processes (covered below) allow you to focus the arc and the filler metal much more precisely. Gas Metal Arc (‘MIG’) Welding An advancement of arc welding, MIG (Metal Inert Gas) welding uses an arc, struck between the workpiece and a continuously fed consumable wire electrode, fed through a torch. The wire is the ‘filler,’ and is melted and deposited into the weld to build up its size. The torch is also connected to a supply of shielding gas to protect the molten weld pool. Controls on the welding machine will usually let you adjust the welding voltage and the wire speed—both need to be increased for thicker materials, and reduced for thinner materials. Shielding gas flow is controlled via a regulator. 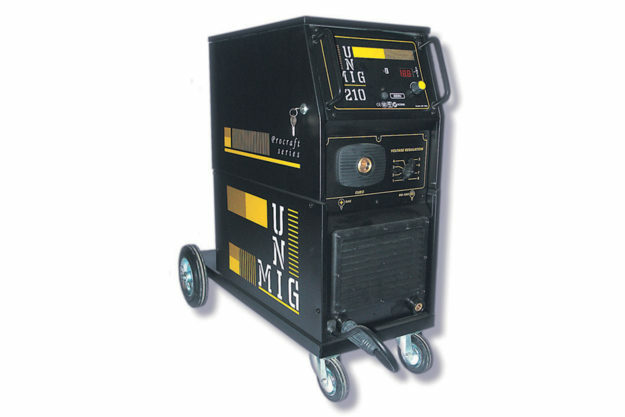 MIG welding machines are very popular, more so in the auto customizing scene. They are relatively cost effective, easy to operate, relatively easy to learn, and once set up, great for one particular metal, such as steel. 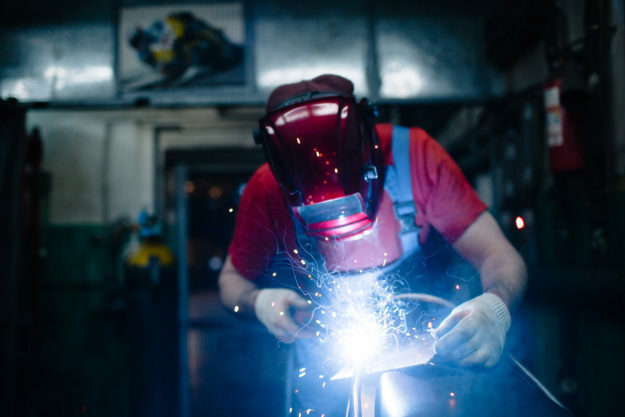 On an auto project, this might be perfect—you can use a MIG welding machine to repair your chassis and panels, fabricate new parts and even weld up a steel exhaust system. But on your motorcycle project, you might want the option of easily configuring the welding machine to suit other metals, such as stainless steel and aluminum. Gas Tungsten Arc (‘TIG’) Welding TIG (Tungsten Inert Gas) welding is another arc welding process. However, instead of using a consumable electrode as in arc or MIG welding, TIG welding uses an electrode made of a tungsten alloy, that is not consumed during welding. A supply of shielding gas—commonly Argon—is used to protect the weld. Since the electrode deposits no extra metal, the operator adds filler metal to the weld. Usually one hand holds the torch directing the arc and shielding gas, and the other hand feeds in filler metal. Some models have a foot pedal to modulate the arc—so you could have both hands and one foot working together. This coordination requires more effort to learn, and practice to master. But if you can operate a motorcycle with a throttle, clutch and gearshift, you can learn how to TIG weld. Control panels on more sophisticated TIG welding machines look complex, but the ability to adjust the machine to suit the weld is one reason I prefer TIG welding for motorcycle projects. 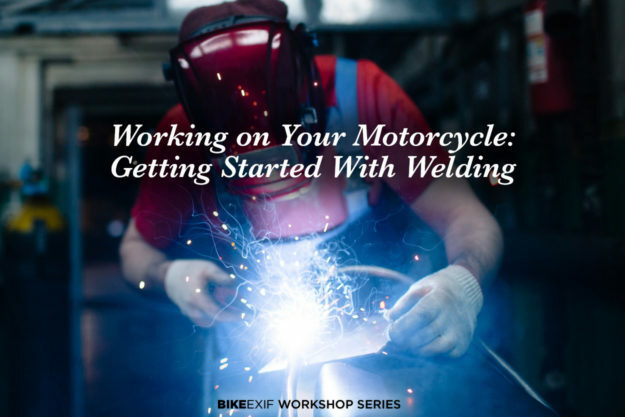 With minor (and relatively cheap) changes to the tungsten electrode and the filler material, TIG welding can be used to weld steel, stainless steel and aluminum—the most common metals you will use on custom motorcycle projects. As a result, TIG welding is my personal choice. Oxy-Acetylene Welding Acetylene is a highly flammable gas, that, when mixed with oxygen, generates a 6,000 degree flame that is great for welding, cutting and heating of all sorts of metals. 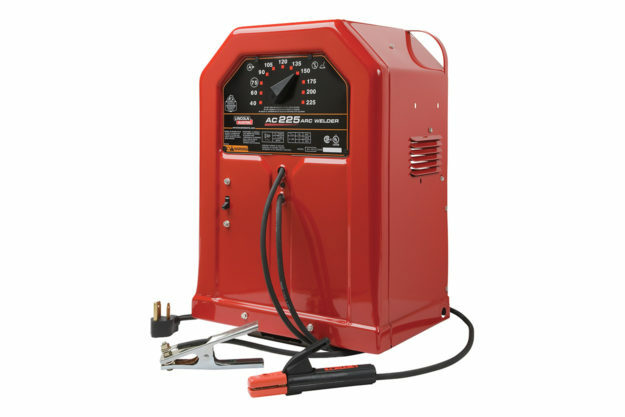 Although modern welding machines are getting cheaper, oxy-acetylene is so versatile that it’s worth a look. Apart from using the flame to weld metals, you can use the cutting attachment to chop up steel plate, and the torch to heat rusted bolts, parts that are stuck, and metal, prior to bending. It needs no electrical connections and is only limited by where you can position the gas bottles and the length of the hoses. 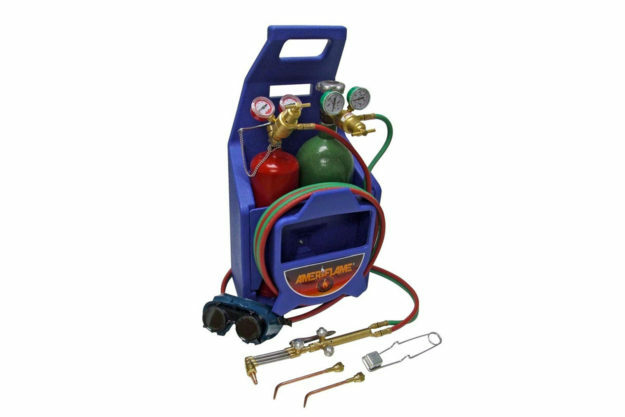 Additionally, an oxy-acetylene welding and heating kit will be much cheaper than a quality welding machine; factor in the cost of gas and it might be the most economical solution for your home shop. With different filler rods, you are able to weld a variety of different materials, however, the heat transferred to the parts can sometimes cause distortion. This is a bigger problem on thin sheet metal. As a result, oxy-acetylene welding might not be your first choice for a motorcycle project. There are also some particular safety concerns. As well as being explosive, acetylene is poisonous, causing nausea and headaches. Oxygen is required for combustion, and if you direct a stream of pure oxygen at something flammable, a fire can start easily, so anything flammable must be cleared away when using oxy-acetylene equipment. There are a lot more safety issues to be aware of, so don’t start using this process based on this article alone—go and research the risks before you light the torch. Choosing a welding machine I’ve had the opportunity to use machines at both the cheap and expensive ends of the market. It’s always tempting to assume a cheap machine can do the job of an expensive one, but in my experience, you get what you pay for. I have used a few low-end machines; the construction is lighter-duty, and they were harder to ‘dial-in’ to the best settings for the job. 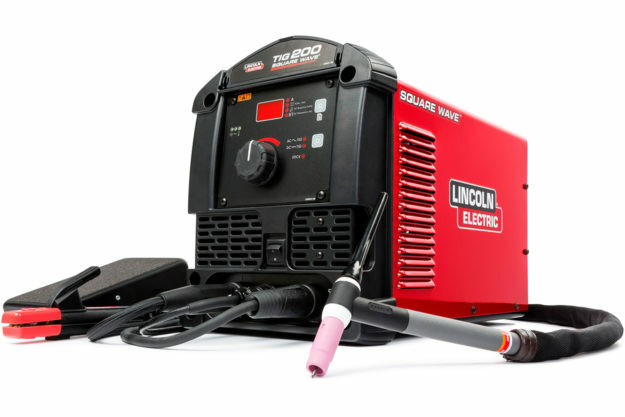 If I could only purchase one welding machine, it would be a good quality inverter AC/DC TIG welding machine, with around 160-200A output that also has arc welding capability. A machine with these specifications should have high frequency starting—technology that gets the arc started easily. 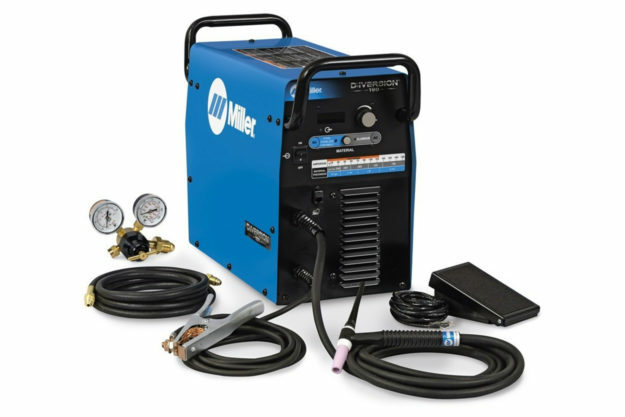 For US readers, I’m talking about a machine like the Miller Diversion 180 TIG Welder (image below). Here in Australia, I use the previous model of this machine, which I purchased a few years back. While a TIG welding machine has the longest learning curve and a high initial cost, I think it provides the highest flexibility for customizing motorcycles. You can weld thinner steels and aluminum alloys with the TIG function, then switch to the arc function if you want to quickly weld up some heavier steel plates. You can build your shop benches and tool boxes, and—with the right know-how—weld repair almost anything. And you’ll never buy another welding machine again, as this investment should last a lifetime. 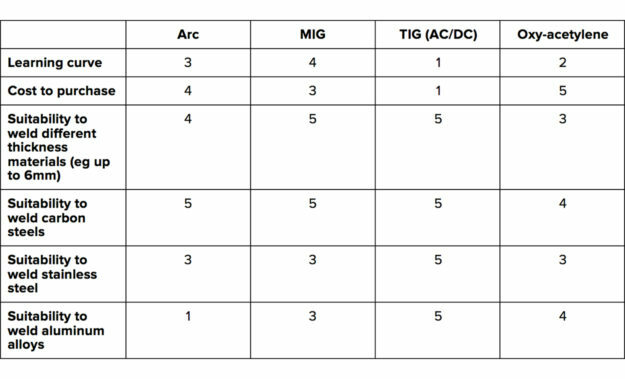 TIG versus MIG I would choose TIG over MIG because MIG requires different spools of wire and different torch cable liners if you are welding different metals. This is more expensive and takes more time to set up. If you think you’ll only ever weld steel, go for MIG. But if you want the option to weld stainless steel and aluminum alloys, TIG is your choice. TIG versus arc welding I would choose TIG over arc welding as the weld control is much better. You can very precisely control where the heat and filler metal are placed. Arc welding is great for heavier fabrication, but TIG wins every time for motorcycle projects. Check back in two weeks, when we’ll tackle safety, and how to get started. Download a free 40-page field welding guide here.